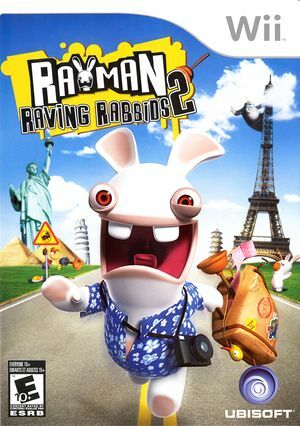 Rayman Raving Rabbids 2 is the second installment of the Rayman Raving Rabbids party franchise, in which the Rabbids attempt to invade Earth and have set up headquarters near a local shopping mall. Players have the option to play as a Rabbid or as Rayman, who has disguised himself as a Rabbid to infiltrate their plans. The game features 54 minigames. This is the first Rayman game to have a E+10 rating by the ESRB, a greater emphasis on simultaneous multiplayer gameplay compared to the original game, and online leaderboards. It is followed by Rayman Raving Rabbids: TV Party, also for the Wii. Various minor glitches occur with this titles movies. Expect various of garbage in the movie scenes. 3D parts have some problems, mostly in the final of the level where the screen should be all blur and most of the time only some parts get blurred. No matter what plug-in is selected, this game will play some noise. The graph below charts the compatibility with Rayman Raving Rabbids 2 since Dolphin's 2.0 release, listing revisions only where a compatibility change occurred. This page was last edited on 16 January 2018, at 23:21.